There is nothing that has been omitted from the Quran on how to guide the human being to fulfill the purpose of his creation. So for us to know how to fulfill our role of discovering, knowing and serving Allah(God), the role for which we have been created, the Quran is the source of guidance to which we have to look . Could then there be anything that is more valuable to us? This Quran then is what shows us the way to Allah(God). First through it being a Miracle it establishes and strengthens our faith in Him. It allows us to be certain that this Message is indeed from Him. Then it further shows the path to Him by showing us what is pleasing to Him. It shows us what we need to do and how we need to be so that we are in a state where He is pleased with us. This really is all that there is to life. To be near the Divine. To seek His Contentment and Pleasure in everything that we do. How much then should we be grateful to Him? Not only for sending us this Quran but also for having given our hearts the ability to bear the Quran. For He says in another verse "Had We sent down this Quran on a mountain, you would certainly have seen it falling down, splitting asunder because of the fear of Allah(God), and We set forth these parables to men that they may reflect." (Quran: 59/21). It is only from His Mercy that our hearts have the ability to bear the strength of this Book. Its words can destroy mountains but Allah(God) has given us the ability to learn it, to reflect on it, to implement what it contains of our duties to Him and to propagate it to others. There are also many hadith from the Prophet(pbuh) where he has told us the great importance of the Quran. The Prophet(pbuh) has told us again and again to learn, teach and be attached to the Quran throughout of our lives. On the Day of Judgement when all of mankind is brought before Allah(God) the Quran will be brought forth also. It will be an argument in support for those who followed. And it will be an argument against those who neglected it and those who opposed it. The Prophet(pbuh) also said in a hadith recorded by al-Bukhari that "The best of you is he who learns Quran and teaches it" (Hadith,AlBukhaari). 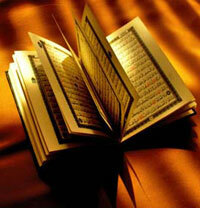 This means Allah(God) will be well pleased by the one who learns His's Book and teaches it to others.